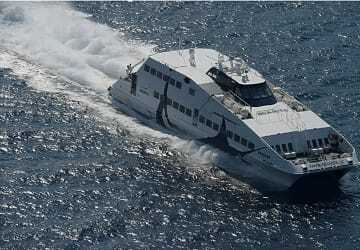 The Rafina Mykonos ferry route connects Athens with Cyclades Islands and is currently operated by 3 ferry companies. 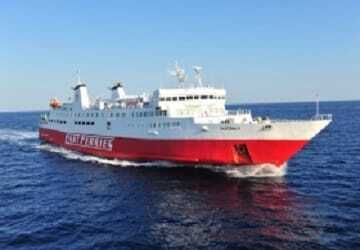 Cyclades Fast Ferries operate their crossing up to 4 times per day, Sea Jets 4 times per day & the Golden Star Ferries service is available up to 3 times per day. 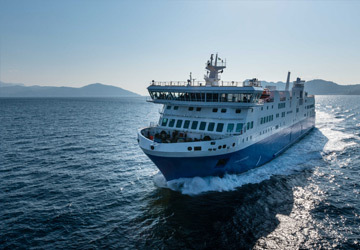 There are a combined 11 sailings available per day on the Rafina Mykonos crossing between Athens and Cyclades Islands and with 3 ferry companies on offer it is advisable to compare all to make sure you get the best fare at the time that you want to travel. Prices shown represent the average one way price paid by our customers. The most common booking on the Rafina Mykonos route is a car and 2 passengers. "From Athens to Mykonos "
"Top speed with comfortable seating. " 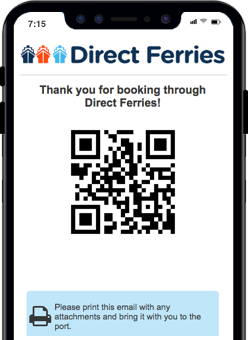 I traveled two times on this speed ferry. The seats are better than the plane and the air conditioning was great. They were very efficient in getting people off and on. This bothered some passengers as they felt rushed. I say time is money. You can take your pictures and gossip at the port. Very affordable in my opinion. You could realistically take a day trip to one of the famous Greek islands with no sweat with these super jets. I will be back.